Jane E. Aaron, "The Little, Brown Compact Handbook with Exercises"
The Little, Brown Compact Handbook with Exercises packages the authority and currency of its best-selling parent, The Little, Brown Handbook, in a briefer book with a spiral binding, tabbed dividers, and more than 150 exercises. 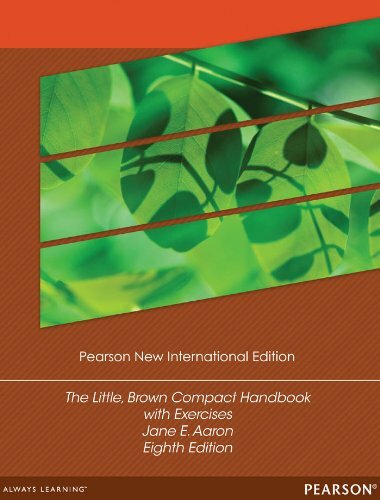 A bestseller since publication, The Little, Brown Compact Handbook with Exercises provides reliable and thorough coverage of handbook basics-the writing process, grammar and usage, research and documentation-while also giving detailed discussions of critical reading, academic writing, argument, writing in the disciplines, and public writing. Widely used by both experienced and inexperienced writers, The Little, Brown Compact Handbook with Exercises works as both a comprehensive classroom text and an accessible reference guide. The Little, Brown Compact Handbook with Exercises has a sibling without exercises. Otherwise identical, both books build on their best-selling features with five emphases: (1) media-rich eText and iPad versions, including video tutorials, podcasts, sample documents, exercise, and checklists;(2)academic writing, including a new chapter on joining the academic community, new coverage of genre, more on summary and academic integrity, and four new sample academic papers; (3) research writing, including new material on finding and evaluating Web sites, social-networking sites, blogs, wikis, and multimedia; (4) thorough and up-to-date documentation guidelines, including the most recent versions of MLA, APA, Chicago, and CSE styles with models of new media in each style and new annotated sample sources; (5) thewriting process, including new material on genre and strengthened discussions of the thesis and paragraphs.